Here is another snapshot of two of our hard working Area Councils, this time North Queensland and the newly formed Metropolitan South Area Council. My passion for the QTU started early on. Living in a remote community meant my entire life was affected by the actions and wins of the QTU; from the size of my classroom, to the number of NCTs, to the standard of the house I was living in. They were all wins from past QTU activists and campaigns. As my involvement and experience developed, so did my appreciation of the work the QTU has done and continues to do on our behalf, and with this knowledge, the wish to do more to be a part of everything the QTU stands for continues to grow. I’ve spent my nine years as an English/humanities teacher at Mackay North SHS, where the likes of Bob Shaw soon introduced me to the local QTU branch. I’ve been involved since then, in branch activities such as fair funding stalls and local campaigns, as well as attending Area Council and State Council meetings. I love teaching and believe that protecting our professional and industrial rights as a union makes our schools better for everyone, especially the students we teach. 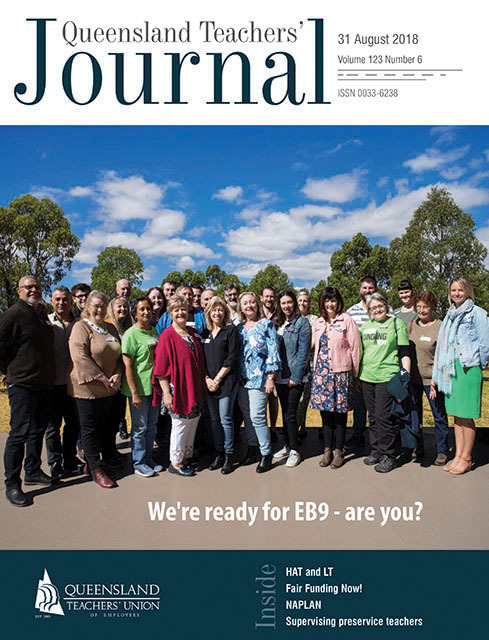 I’m particularly proud of the work that the QTU has done to support the LGBTIQ+ community, through our recent campaigns to support diversity in schools and marriage equality. I teach biology, chemistry in 11, 12 and adults classes, as well as junior science and occasionally junior maths. I have been active in the Union since I started - I was very upset by the injustice and the power imbalances in workplaces. I quickly became a Rep in schools, and started on NQ Area Council in 2004. I have a passion for teaching students from culturally and linguistically diverse backgrounds. Currently, I am A/HOSES, English as an Additional Language and Dialect (EAL/D) at an Ipswich high school. My QTU roles include Brisbane South Area Council Delegate to State Council, Brisbane South Area Council Vice-President, Mt Gravatt Branch Women’s Contact, Union Representative, Professional Issues Committee, Culturally and Linguistically Diverse Sub Committee and Unions for Refugees. I choose to be an industrial activist because I am strongly committed to representing the voices of the teaching profession and my students. It is a privilege to be a member of the Area Council as it enables me to keep up to date with current professional issues and the actions being taken to deal with them. Area Council meetings also give me an opportunity to catch up with my activist colleagues, listen to their stories and learn. As an educator and an industrial activist, I will always be an advocate for progressive ideas and consultatively participate in and develop action strategies that lead to a more equitable society. I first chose to become a school Union Rep after witnessing the inequities of how different staff members were treated at schools I had worked in. It became apparent that only by “working together” can we provide a fair and just system for all. As a member of Area Council, I have come to understand just how vast our “team” is and how much we can achieve combined as one! I became a union rep because I was encouraged by my Organiser, Kevina O’Neill. I joined Area Council when I was a teacher in Logan, there was a position vacant and I was keen to step-up. As a teacher, I think we want to improve and enhance the lives of the students and teachers, the QTU allows us to do this. Being part of Area Council gave me the opportunity to see that not all problems are isolated to my school, it could be felt in a region, a state or nation-wide but meeting as a collective gives us an opportunity to work together to ensure the best possible outcome for teachers and their students. Since joining Area Council I have become very active, I’m on State Council, committees and Executive and I have loved every moment go it. Together with my colleagues on MSAC, I have helped support and promote grassroots campaigning for our rights as teachers and the rights of our students. We’ve collectively supported and contributed to the demand for air conditioned teaching spaces, helped clarify salary pay scales in the last round of EBA negotiations, supported the Safe Schools program as well as participated in the ground-breaking campaign by Yeronga SHS teachers to fight for the freedom of refugee student Mojgan Shamsalipoor. As the wave of teachers’ strikes in the United States shows us, our power as teachers lies in collective action and working together to fight for better conditions, not just for educators but for students, school staff and the community.